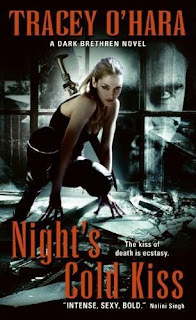 Tracey O'Hara's debut urban fantasy novel Night's Cold Kiss officially releases in the US on August 25th (next Tuesday), although I understand it has been available here in Canada for a few days. 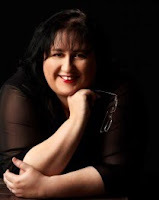 Tracey kindly offered to answer a few questions about herself and her new book and to drop by and answer commentator questions, so please say hi and ask away. Remember of course that Tracey is in Australia so there is a bit of a time difference when it comes to responses. If you would like to read my review of Night's Cold Kiss you can find it here. Thanks for having me here Doug for my first book release. I came to writing only a few years ago and at first wasn’t sure what genre I would write in and kind of fell into NIGHT’S COLD KISS. It slowly evolved into what I found out was called Urban Fantasy. Some of my biggest influences in a literary sense growing up were Stephen King and Raymond E Feist. Fantasy and horror were always my favourites to read. But I have been a big Sci-fi geek since I first saw Star Wars at the movies when it first came out in 1977 (no I am not telling you how old I am). I don’t read much sci-fi but watch a lot TV shows and movies. Very big Joss Whedon fan. All of this has gone into influencing what I write. 1. 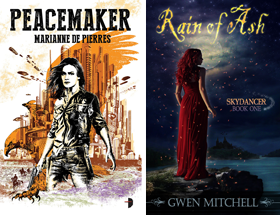 What it’s like being an urban fantasy author in Australia breaking out into the international market? Australia is a long way from the US (and even further from Canada). But the internet has made the it a much smaller world - thank goodness. While Nalini Singh and Keri Arthur are huge New York Times bestsellers, downunder their audience isn’t as big and they are not as widely known as they are in the US. However with the Twilight phenomenon in both books and movies and True Blood TV series (which has turned people onto the Charlaine Harris’ Southern Vampire books), people are suddenly interested in vampire and paranormal books. I walked into our local book store the other day to ask how paranormal books were doing and was told that just about every second book they sold was a vampire novel. So there may be hope for us yet. Night’s Cold Kiss evolved out from a world with a complex social structure where parahuman creatures and humans live in a mostly symbiotic and at times reluctant co-existence. There are rules and structures to follow, laws to obey and if not then there are consequences to pay. I think this world has existed in hidden in my head for many years just waiting for me to crack that door open. It was a spark of an idea that opened the window to my own version of Earth. And now that I have, I’m still discovering things about it every day, and it is as fresh and exciting to me today as it was when I first started thinking about it. 3. What Forthcoming projects are you working on? I am just about to hand in the second book in the Dark Brethren series called Death’s Sweet Embrace and then begin the third one. I am very excited to get onto that one. Death’s Sweet Embrace center’s around 2 animalians, this time felian and canian (werecat and werewolf) with appearances by familiar characters form book one. Again you can expect some serial killer action and thrills. I won’t bout book 3 as it’s still in the planning stage. Thank you for having Tracey O'Hara here on your site. NIGHT'S COLD KISS sounds great! I am so glad I subscribe to your site for you have led me to another book & series I must read. Thanks for having me here - I so love this site. Like RKCharron it leads me to new books and authors - and I'm happy to be one of them. Annette - not sure that it is out yet - even though it still says the 14th on Amazon and HarperCollins Canada, it is still listed as pre-order. Now it's only a few days for both of us. I loved your review and interview, thanks for introducing another new author. Tracy, welcome to the world of the publisher author, may you have many more books to come. I've read the blurb and Doug's thoughts, and it's a book that will be going onto my list. New urban fantasy, can't wait to try it! Thanks Dottie - I really hope you enjoy it. This is a definite must-have book Tracey. You are one talented lady. I'm in Australia and I can't wait for Night's Cold Kiss to be released here! Tracey, I love your titles and I'm looking forward to Death's Sweet Embrace already. Louise - right back at you. It's only a matter of time I'm so sure. and Don't forget - you are stocking up those karma points. Maree - you sweet kiwi. I loved meeting you and the conference last week, just wish I had more time to spend with you. It went by so fast I can't believe it. When over this deadline I am going to reward myself with some reading and Even Demons get the Blues is right up there. Can't wait. Rachel - Thanks sweetie. It's not long now. Back to writing those missing words. Hi Tracey, Great "seeing" you here! I'm so excited for you and the release of "Night's Cold Kiss". Loved your book trailer too - gave me shivvers! Being in Australia means having patience procuring a copy (why oh why am I not in Canada). I'm seeing your book as my reward for good behaviour. Personally, I'm looking forward to YEARS of your books adorning my shelves. And yes, i agree with Nicky, we must have patience when waiting for books here in the land of Oz. Oh and that cover is brilliant. Glad I finally met you at the conference. Great interview Tracey. This is such a great novel, can't wait for it to be released so I can buy my copy. Yes I'm going to re-read it, why? Because it is fantastic. I'm looking forward to reading the next one. I want it, I want it, I want it! Have I mentioned that I love the cover, as well as the concept? Wish I had had a chance to spend more time with you on the weekend, but I will do it vicariously through the book - when I can lay my hands on it! Note to all. I'll be having a giveaway of Tracey's book starting Wednesday Aug 26. Three copies to giveaway - unfortunately restricted to US residents only.